How do I store and find supporting financial documents? 12 period closings are 12 recurring projects. How can you save and find all supporting documents for a closing in the? How can I share these documents with my Auditor? 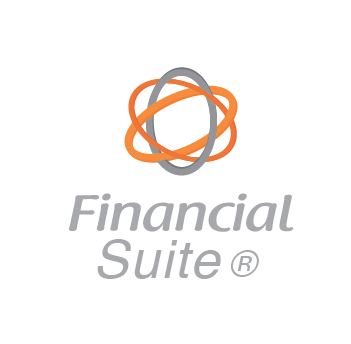 Simply use Financial Suite® & Office 365. 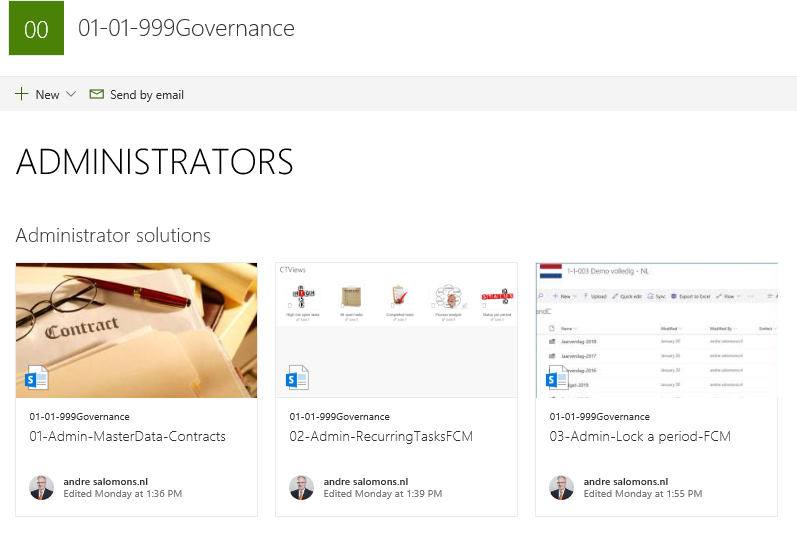 Metadata, audit trail & SharePoint. 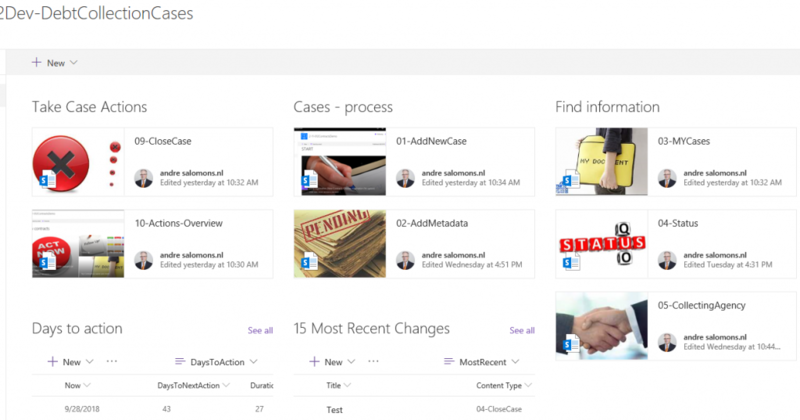 Microsoft Teams will enable you. How can I report in time? How do you manage to report before the deadline. How do I monitor progress in the closing process? Our monitoring tool enables you to have the total picture. It delivers included checklists and enables team members and managers to see the status of the closing process at any time. Every task has these essential metadata: Risk, Assigned to, lead time and more. Audit trail available. How can I monitor and find my contracts? How can I find company information and company documents? Minutes, annual reports, publications related to your legal entities can be found here. Besides this information you can see all shareholders, advisors, board members can be stored and found here. How to share procedures & processes? Maintaining and publishing procedures, working instructions etc. for ISO QA management and the Digital Accounting Manual. All in the Cloud, any time, anywhere available. How can I manage one off projects? Full options to monitor progress, contracts and documents. Monitoring of hours is done in your main system. How can I manage employee contacts and contracts? How can I monitor cash collection by third parties? This solution helps you to monitor cash collection by third parties. Follow progress, time elapsed, follow up etcetera. How can I achieve Fast Close for my organization? These solutions facilitate to control your closing process. Just simple.. Need to know more? One thing in Common: Everything needs to be easy! 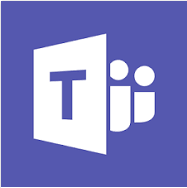 Maybe you are familiar with Microsoft Teams and Financial Suite® solutions for financial closing, contract management, corporate housekeeping and QA management. 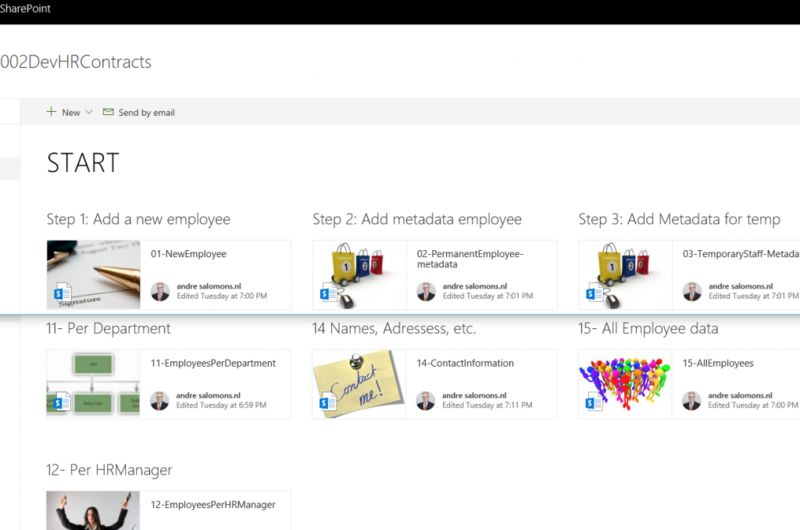 If you want more than Office365 , you now can use Teams. Really everything on one place where you can start all your applications. Including Outlook and skype. 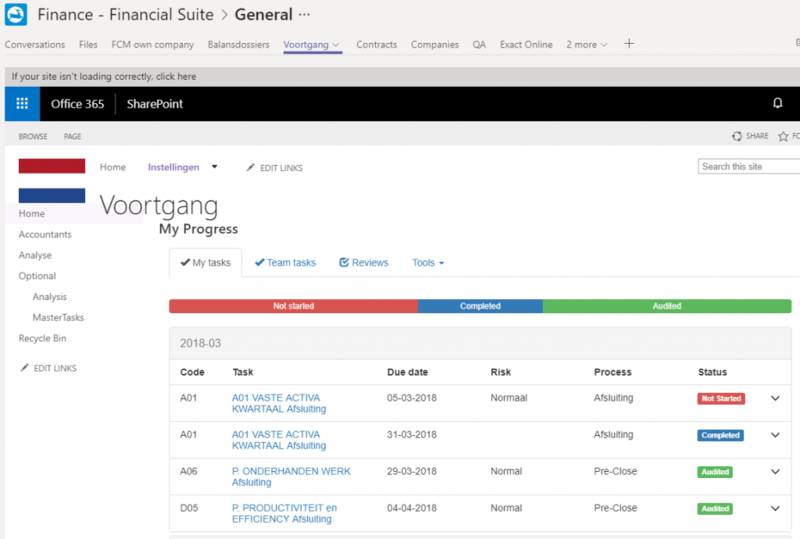 Office 365 with SharePoint online, Microsoft Teams en Financial Suite® makes you more efficient. NedCard produces and tests microprocessors for suppliers of smartcards and RFID-products for telco’s, banks and government. To comply with the quality and security rules, predominately from banks, NedCard needed to store all documents in one place to improve document management. Financial Suite® installed Quality Assurance manager, trained the staff and helped to bring the organization to the next level with their new intranet. 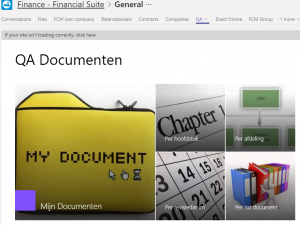 De keuze voor de SharePoint-toepassing Financial Suite werd in de eerste plaats ingegeven door de flexibiliteit van het platform; documenten in willekeurig bestandsformaat kunnen in het systeem worden geplaatst. De doorslag gaf het feit dat dit product standaardisatie van het financiële rapportage en controleproces op een natuurlijke manier faciliteert.